Though I live in New York City, with its world-class public transportation system (mostly), I must admit that I’m more of a car person which means I drive, I taxi, I Uber and now I uberFAMILY. And I bet lots of other parents will too, considering their smart new on-demand car seat option that just launched in NYC. With the touch a button, your Uber app will now be able to connect you with one of their highest-rated uberX partner drivers, which is reassuring, with a car equipped with a child seat so you can safely buckle everyone up. Even the little ones. To make things even better, the new service was developed in partnership with The Car Seat Lady, Dr. Alisa Baer, who trained the service’s uberFAMILY drivers on how to safely secure the seats. In fact, they were all manufactured specifically for Uber by IMMI. The whole thing is a stroke of genius. Normally there is a $10 surcharge for uberFAMILY rides, but to celebrate Mother’s Day, Uber NYC is kicking off their new service with a surcharge-free weekend sponsored by Care.com. Thanks Care! And, yes, though I sometimes slip into thinking that my Big Apple is the center of the universe, I know that not everyone can take advantage of uberFAMILY the way that I can just yet. But I also know that Uber was just in a small handful of cities not so long ago. They’ve expanded quickly and our hope it that uberFamily will, too. Because if you’re a taxi-taking city mama? You know just what a big deal this is. To learn more about uberFAMILY, including how to unlock the view on your Uber app and safety details, visit the Uber blog for details. 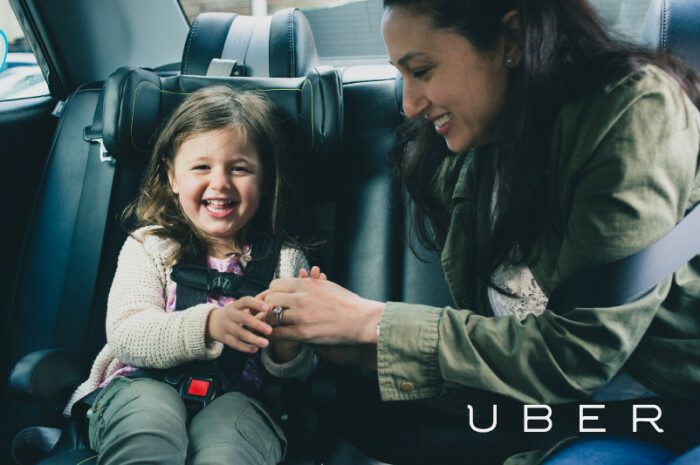 If you’re new to Uber, make sure to sign up for the service online using this link with the promo code CARSEAT for $30 off of your first Uber ride. Once signed up, download the Uber iPhone app or Uber Android app and enter the code.